The Old Testament Book of Chronicles is something of a scholarly conundrum, as no consensus has yet emerged about the authorship, date, genre, or even the purpose of the work. Schweitzer employs utopian literary theory to offer a holistic approach to the coherence of this text. - Publisher Once at the center of HB studies in the work of Wilhelm de Wette, and progressively moved to the margins where it was entrenched by Julius Wellhausen, the book of "Chronicles" has enjoyed a resurgence in scholarly interest in recent decades. However, no consensus has emerged from these numerous studies on even the most basic of issues: the authorship, date, genre, and purpose of the work have been at the center of much debate. For example: is the work from the Persian or Hellenistic or even Maccabean period; is it history or historiography or midrash or something else; is it originally the work of priests or Levites, and was it redacted by the other group and to what extent; what is its relationship to its sources - especially the Pentateuch, Samuel-Kings, and the Ezra and Nehemiah materials; how many redactions has it undergone and which sections belong to each; and what are its main theological interests? Rather than focus on one of these issues, which has been the trend of a majority of recent publications, this examination employs a literary approach in an attempt to address the coherence of "Chronicles" as a whole. 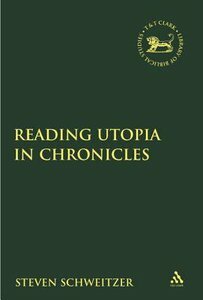 Three major concerns of the "Chronicles" commonly discussed by scholars (genealogy, politics, and the temple cult) are examined through the lens of utopian literary theory. About "Reading Utopia in Chronicles"
Once at the center of HB studies in the work of Wilhelm de Wette, and progressively moved to the margins where it was entrenched by Julius Wellhausen, the book of "Chronicles" has enjoyed a resurgence in scholarly interest in recent decades. However, no consensus has emerged from these numerous studies on even the most basic of issues: the authorship, date, genre, and purpose of the work have been at the center of much debate. For example: is the work from the Persian or Hellenistic or even Maccabean period; is it history or historiography or midrash or something else; is it originally the work of priests or Levites, and was it redacted by the other group and to what extent; what is its relationship to its sources - especially the Pentateuch, Samuel-Kings, and the Ezra and Nehemiah materials; how many redactions has it undergone and which sections belong to each; and what are its main theological interests? Rather than focus on one of these issues, which has been the trend of a majority of recent publications, this examination employs a literary approach in an attempt to address the coherence of "Chronicles" as a whole. Three major concerns of the "Chronicles" commonly discussed by scholars (genealogy, politics, and the temple cult) are examined through the lens of utopian literary theory. Dr. Steven Schweitzer (Ph.D., University of Notre Dame) is Assistant Professor of Old Testament at Associated Mennonite Biblical Seminary, Elkhart, Indiana. He is the author of Reading Utopia in Chronicles. Abbreviations; Chapter 1: Introduction; 1.1 The Current State Of Chronicles Scholarship 000; 1.1.1 Authorship Of Chronicles; 1.1.2 Date Of Chronicles; 1.1.3 Genre Of Chronicles; 1.1.4 Three Major Themes In Chronicles; 1.1.4.1 Genealogies; 1.1.4.2 Politics; 1.1.4.3 Temple Cult; 1.1.5 The Present Situation And A New Approach To Chronicles; 1.2 A New Methodology: Utopian Literary Theory; 1.2.1 Definition Of Utopianism; 1.2.2 The Methodology Of Utopian Literary Theory; Excursus: St. Thomas More's Utopia; 1.2.3 Utopianism And Its Literary Form In The Ancient World. 1.2.4 Utopianism In Chronicles; Chapter 2: A Genealogical Utopia; 2.1 The Genealogies: Brief Comments On Purposes And Forms; 2.1.1 Purposes Of Genealogies; 2.1.2 Forms Of Genealogies: The Function Of 1 Chronicles 1-9 As A Literary Preface; 2.2 The Genealogical Identity Of "israel" In Chronicles:; Genealogy As Utopia; Excursus: Prophecy, Speeches, And Authority In Chronicles; 2.2.1 Constructing A Lineage: Examples Of The Chronicler's; Utopian Use Of Sources; 2.2.2 The "twelve Tribes" Of Utopian Israel: Identifying "israel"; 2.2.3 Judah And Levi In Privileged Positions; 2.2.4 "israel" Among The Nations: Universalism And Particularism In Chronicles; Chapter 3: A Political Utopia; 3.1 The Davidic Monarchy In Chronicles; 3.1.1 Saul, David, And Solomon (1 Chr 10-2 Chr 9); 3.1.2 Rehoboam And Abijah (2 Chr 10-13); 3.1.3 Asa And Jehoshaphat (2 Chr 14-20); 3.1.4 Jehoram, Ahaziah, And Athaliah (2 Chr 21-22); 3.1.5 Joash, Amaziah, And Uzziah (2 Chr 23-26); 3.1.6 Jotham And Ahaz (2 Chr 27-28); 3.1.7 Hezekiah, Manasseh, Amon, And Josiah (2 Chr 29-35); 3.1.8 The Final Four: Jehoahaz, Jehoiakim, Jehoiachin, And Zedekiah (2 Chr 36); Excursus: Burial Notices As Utopian Space In Chronicles; 3.2 A Utopian Future In Chronicles: Conclusions About The Political Dimension; 3.2.1 Restoration Or Reapplication? : A Synthetic Reading Of The Monarchy In Chronicles; 3.2.2 The Exile And Its Implications For Utopia In Chronicles; 3.2.3 Utopia Under The (persian) Empire? ; Chapter 4: A Cultic Utopia; 4.1 A Utopian Temple: The Priesthood, Sacrifice, And High Priesthood In Chronicles; 4.1.1 The Identity Of The Priests; 4.1.2 The Duties Of The Priests; 4.1.3 The Sacrificial System; 4.1.4. The Zadokites And The High Priest In Chronicles; 4.1.5 Looking In The Wrong Place: Neither A Zadokite Nor Priestly Utopia; 4.2 Locating The "good Place": The Levites And The Production Of Utopia; 4.2.1 The Identity Of The Levites; 4.2.2 The Duties Of The Levites; 4.3 A Utopian Future In Chronicles: Conclusions About The Cultic Dimension; Bibliography; Index Of Primary Sources; Index Of Modern Authors; Index Of Subjects.